"I made these when I had my bar, and they were always a big hit. I made them in large batches because of the standing time, but have scaled the recipe for home use. Extra large eggs are boiled, then pickled in a simple brine solution. For a variation, add dry minced onion flakes, crushed red pepper or hot sauce to the brine." In a medium saucepan over medium heat, mix together the vinegar, water and pickling spice. Bring to a boil and mix in the garlic and bay leaf. Remove from heat. Transfer the eggs to sterile containers. Fill the containers with the hot vinegar mixture, seal and refrigerate 8 to 10 days before serving. See how to make classic pickled eggs. This recipe isn't what I thought it would be. I will try other recipes. I absolutely love these eggs, I follow the recipe adding just a little more water and leave them set for 8-10 days...everyone I've given them to liked them as well. They are great with beer! My southern boyfriend made these eggs exactly as the recipe says. He said, "They are just like mom used to make." 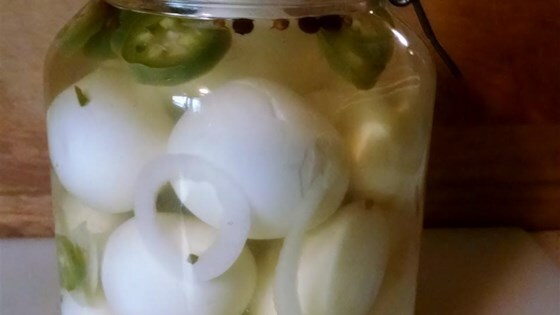 This is the easiest pickled egg recipe ever! So easy and quick. I cannot wait for a week until they are ready to eat!